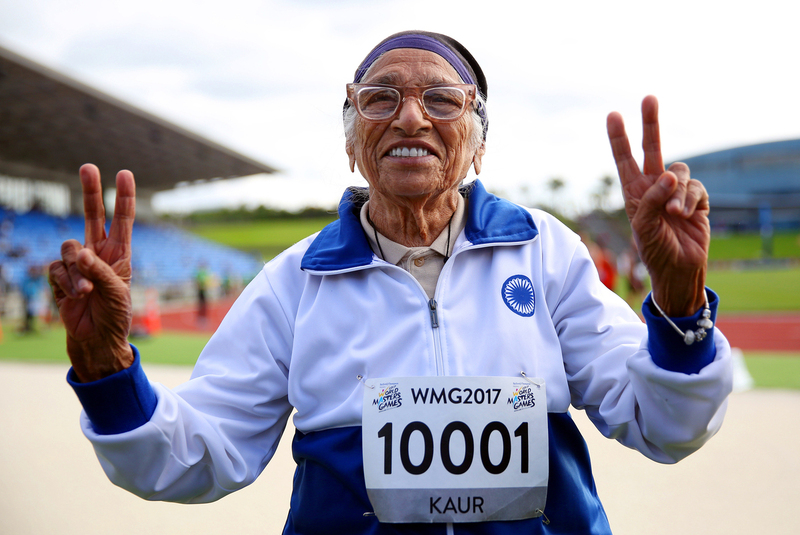 At Age 101, Man Kaur Of India Is A World Champion Runner : Goats and Soda Man Kaur of India has won 17 gold medals in her age category. And now she's trying her hand at javelin. Every day she wakes up at 4 a.m., bathes, washes clothes, makes tea, recites prayers until about 7 a.m. Sometimes she goes to the Gurdwara, the place of worship for Sikhs, other times she prays at home. And then she goes to the track for an hour of sprinting practice. And she's not just doing it for fun. A competitive runner, Kaur is a world record holder in her age group for several categories and is now training for the Asia Pacific Masters Games in Malaysia next September. The centenarian is a role model for women and runners everywhere. Just this November, she was declared the brand ambassador for a nonprofit organization called Pinkathon, which raises awareness of women's health issues — and encourages running as a way to improve physical fitness. At the Pinkathon announcement event, Kaur was literally mobbed by gushing women, many of whom started running in their 30s and 40s. "She's such a star," says Sonia Kulkarni, from the organization. "At her age, she's so fit, enthusiastic, alive, independent. She's a world champion!" Setting aside her customary track suit, Kaur dressed for the event in a pristine white tunic and traditional pleated trousers. Topping off her ensemble is her winner's blazer from her most recent championship win in New Zealand in April 2017. People are taking selfies with her and asking for her blessings. She's happy to chat with everyone. Behind her glasses, her eyes shine. "She's an inspiration and I'm so happy to have met her," says 40-year-old runner Raksha Muni. The diminutive Kaur hasn't been a lifetime runner. Far from it. She started running in 2009, when her son, Gurdev Singh, 79, urged her to take up track and field. Since starting her competitive career, Kaur has run in meets in Canada, Malaysia, New Zealand, Singapore and Taiwan. And she's nailed 17 gold medals. But the grandmother of nine (and great-grandmother of 14) keeps at it. In 2018, in addition to competing in the Asia Pacific Masters Games, she plans to run in the World Master Athletic Championships in Spain as well as participate in races in Bangalore, Delhi and Mumbai.